The Fourth Industrial Revolution is upon us and our current workforce is not ready for it. At Wildcat Venture Partners, we are painfully aware of this. But beyond the pain, we also see great opportunity. That is why we are helping to launch a new education category, one that is focused on preparing the workforce for jobs in the 21st century and the new digital economy. First, let us define what we mean by the Fourth Industrial Revolution. It is the ongoing revolution carrying us from the current electronics and information technology age that began last century, into one that will blur “the lines between the physical, digital, and biological spheres” as World Economic Forum founder Klaus Schwab says — a digital economy. The digital economy is leveraging new technologies such as artificial intelligence, robots, self-driving vehicles, 3-D printing, nanotechnology, biotechnology, materials science, energy storage, and quantum computing. Unlike the last three industrial revolutions, which impacted specific industries, this one will be — and already is — pervasive, influencing every organization and every industry at every level. This revolution is fueled by digital technologies that are being embedded in all business functions. While machines and capital drove the last industrial revolution, the digital economy is driven by systems of intelligence and digital oil — data. We actually view this as great news. Thousands of well-paying jobs are already open for people who can operate the soft machinery — business application software — of the digital economy, and we expect those numbers to grow exponentially. The caveat: There just are not enough people who are properly trained to fulfill the demand. These are not technical positions that must be staffed by highly technical engineers, computer scientists, or individuals with advanced science and technology degrees — and represent little more than 5 percent of the workforce. We are not talking about low skilled (e.g. retail) or vocational roles (e.g. nursing, welding, or carpentry) which make up about 50 percent of all US positions. Instead, we are referring to the remaining 45 percent of US jobs that are considered “professional” and open to anyone who has at least 2 years of higher education, is creative, a critical thinker with a desire to learn, and trained to use business application software to generate business value. These are jobs that can be filled by the under-employed; the baristas and store clerks who may have two or four-year degrees but cannot land a job because they have not been trained to be “business scientists” who understand how to operate the business application software solutions that enable companies to capture, analyze and utilize customer, financial, market and product data. At Wildcat, we have been exploring ways in which people can quickly acquire business science skills. Existing educational institutions and methodologies are inadequate because they lack business application software training and real-world experiential mentoring. Online programs — which do not focus on business science, do not offer industry-based certification, and do not provide useful work experience — will not suffice either. With no viable options, Wildcat founding partner Bruce Cleveland spearheaded the first successful pilot of a new micro education model. This pilot tested a number of theories on how best to train a workforce that is intelligent, creative, and willing to devote one semester — 200 hours — to learn a new skill. After two years running the pilot program — Bend Polytechnic Academy (BendPoly) — in Bend, Oregon, and focusing on marketing science, he determined the following: When given hands-on, live, interactive instruction, students could quickly become proficient using business applications such as Google Analytics and Marketo marketing automation software. The BendPoly students were also asked to develop real marketing campaigns for actual businesses. The result of the program: More than 80 percent were placed in marketing roles at notable companies such as Groupon as well as small startups such as Kollective. For example, Amber Caisse entered BendPoly with an undergraduate degree from Boston University, a Master’s degree from Concordia University, and experience living and working abroad. But it was the BendPoly microdegree program that gave her the skills and experience she needed to actually secure a job. These were skills she said she just did not get through her undergraduate and MBA studies. Amber believes the skills she learned through BendPoly gave her an edge over others, which enabled her to quickly take on projects without a long learning curve. As a result of the pilot, Wildcat Venture Partners elected to create and fund a new entity offering courses in multiple business disciplines and designed to scale — GreenFig. 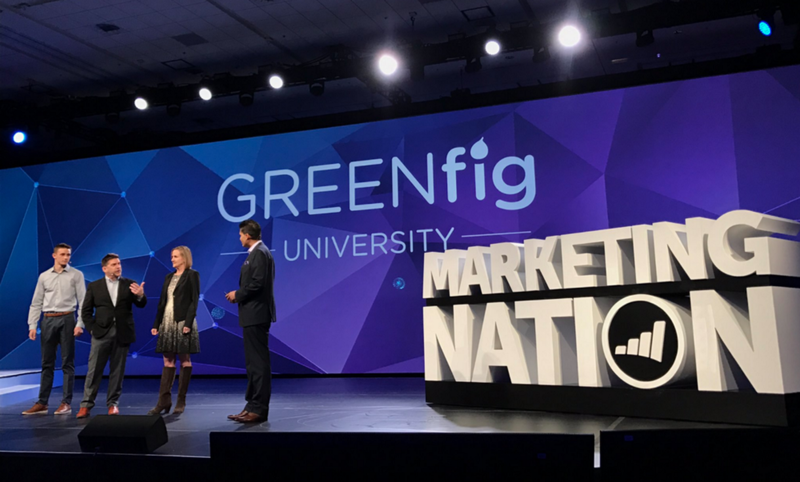 GreenFig is a micro education company offering microdegrees in applied business science, including customer success, marketing, products, sales, service, and support. GreenFig provides students with the hands-on, interactive training they need to understand business process and learn how to use business application software. GreenFig’s microdegrees offer highly-focused, highly-concentrated applied business science degrees designed to make students job-ready in less than 200 hours. GreenFig prepares its students to sit for certification exams from industry-leading application software providers such as Marketo. People with these certificates of proficiency are what employers are seeking. Through the GreenFig program, students gain both the knowledge and work experience they need to implement and operate the business application software that drives most organizations. GreenFig fits into Wildcat’s investment strategy to create, find and/or incubate interesting early-stage companies in or about to reach, the Traction Gap. These companies are somewhere between releasing their first product and a point in time when they can generate some sort of market validation signal and a positive growth trajectory. We provide our portfolio companies with the necessary resources, including mentoring and best practices, to traverse the Traction Gap. We established the Traction Gap Institute (TGI) to help guide our companies and the greater entrepreneurial community. We have interviewed dozens of successful CEOs and founders in order to discover how they were able to traverse the Traction Gap. We are taking that information, compiling it into tips/tricks, and then publishing them in playbooks, and discussing them in workshops so that our portfolio companies have the best opportunity to succeed. The Traction Gap Institute is open to anyone who wishes to join — at no cost. GreenFig is using the Traction Gap principles and operating model developed by Wildcat to ensure it is prepared to scale to meet the demands of industry and the digital economy. Hold on because it is going to be a wild ride. Want more? Visit www.wildcat.vc and follow us on Twitter, LinkedIn & Facebook. The opinions expressed here represent those of the author and not necessarily the views of Wildcat Venture Partners.